Discover what your body wants to say within a Creative Kinesiology session. Creative Kinesiology is a branch of kinesiology which helps you talk to your body, and find out what it is trying to tell you. We call this body-tracking. Our bodies are wise – all the experiences that have happened to us throughout our lives are held within our bodies. Symptoms come about so we can listen to what our bodies are saying – they have no other way of speaking. These symptoms can show up as any kind of discomfort, stress, aches and pains, digestive difficulties, low energy, ongoing problems of any kind, including relationships, family and not being able to achieve your goals in life. With Creative Kinesiology, we can track your problem, discover why it is there and, from our wide array of techniques available, find what will make the difference to you. We use muscle biofeedback (muscle-testing) - a method that comes from chiropractic - as a way to do this tracking and talk to your body. We also include bodywork techniques that originate in chiropractic work, and energy work from Ancient Chinese Medicine. Our Creative Kinesiology practitioners are extremely well trained and thorough. We love the work we do – making a difference by helping your body to work effectively. Each session is tailored to you, because you are unique, and your body will be talking just about you – on all levels of body, mind, emotions and spirit. Muscle-testing is a wonderful, gentle and non-invasive tool, used by kinesiologists in order to get direct feedback from a person’s body, mind and energy system. It involves the application of light pressure to a muscle in order to see if it’s able to hold it's tone under that pressure, or not. In Creative Kinesiology we follow our unique approach called 'Tracking'. Using muscle-testing, we ask your body questions and build a picture of your overall health. All levels are addressed: physical, mental, emotional, nutritional, biochemical, and spiritual. Monitoring changes in muscle response can provide us with a host of clues about a person’s whole being. Through our creative approach we are able to discover the story behind the feedback as well as the means to rebalance and get back on track. In the 1960s, a well-respected chiropractor, Dr George Goodheart, made the first links between finding a weak muscle using manual muscle-testing and using chiropractic therapy to make it stronger. He then looked beyond the chiropractic profession to other fields for methods to increase the health and well-being of patients based on using the body itself as a diagnostic tool. Working with his colleague, Dr Alan Beardall, he synthesised techniques from chiropractic, naturopathy, osteopathy and acupuncture for use by medical professionals and founded Applied Kinesiology. Not only did Applied Kinesiology recognise and describe the relationship between muscles and vital organs but by including acupuncture theory, every organ function was paired with a particular energy pathway or meridian. A relationship was acknowledged between muscles, organs and meridians. From these basic discoveries, Applied Kinesiology grew into a broad and comprehensive field of alternative healing. In 2001, Goodheart was placed onto Time's List of the Top 100 Alternative Medicine Innovators of the 21st Century. 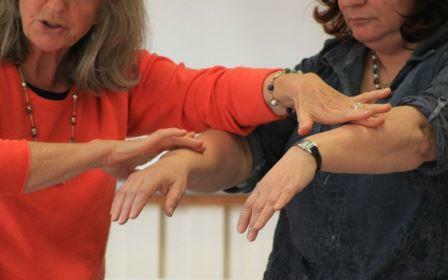 In the 1970s, seeing how some of these simple, safe techniques could be used by lay people, Dr John Thie created Touch For Health, a system of kinesiology which is now widely recognised in over 100 countries. Creative Kinesiology has since developed this knowledge and discovered exciting new applications and techniques. Learn more about the history and development of Creative Kinesiology. Would you like to know more about Creative Kinesiology?